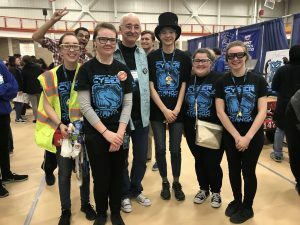 The Cyberstangs of Merritt Academy in New Haven is one of more than a dozen high school FIRST Robotics teams in Macomb County. This team is in its fourth year, but FIRST has been in existence since 1989. Teams are tasked with designing, building, and programming a robot to compete against other teams. FIRST (For Inspiration & Recognition of Science & Technology) encourages interest and participation in science and technology in students from elementary to high school. Their hands-on approach to learning fosters not only technical skills, but also confidence, communication, and leadership skills. Naomi Elliott is a 9th grader at Merritt Academy and is in her second year of robotics. 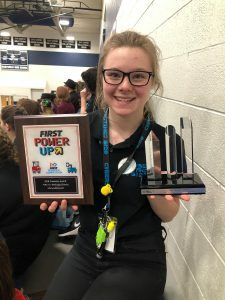 She says that the benefit to her in participating on the Cyberstangs, other than “getting out of school” at times for robotics events, is that being on team has helped her see a path for her future in engineering. The Cyberstangs expect a lot out of their members and holds them to a high standard to join the team. Naomi explained that students need to maintain a good GPA, participate in community service, and meet required attendance and participation levels at team meetings. These requirements, however, have not held this team back from bringing in 18 members. As 14 of the 18 members are female, this team also leaves the stereotype of STEM fields’ appeal being male-dominated in the dust. Teams are responsible for the full scope of the project from conception through competition. Each is divided into sub-groups with different responsibilities including Business, Build, Chairman’s (which communicates with FIRST and other teams), Programming, Strategy, and Drive Team. Naomi says the actual robot build time is only six weeks, but the business and strategy components are year-long endeavors. In addition to the need for fundraising and sponsorship for each team, Naomi stresses the other important piece that the Cyberstangs and many other teams need – mentors. This help is needed from many different areas. Many of the team members are starting from scratch in learning the basics of the skills that are needed to complete their robots. While they can rely on YouTube for some how-to advice, adults with mechanical, electrical, technological, and engineering skills are especially needed to help introduce and guide the students in their builds. This can range from a review of basic tools and concepts to a lesson in pneumatics. Another avenue for manufacturers and suppliers to get involved is by donating unneeded parts and inventory that can be used to build robots. The theme for the next FIRST Robotics competition is Destination: Deep Space and will kick off in January 2019. Naomi and the Cyberstangs will be ready and working hard.